I have here an icon – if you can’t see it very clearly it is a picture of the Virgin Mary holding the baby Jesus. This is my icon but it is currently living in the Lady Chapel and there is another one in there of very similar design – again with Mary holding Jesus. Here’s another icon – which Vivienne kindly bought for me one Christmas – and this is an image of the nativity scene – we have the star shining on the scene with Mary looking at the swaddled infant Jesus and there are even some cows looking on – perhaps being beatific but probably wondering why their trough is being used in this strange way. You can have a good look at these after if you would like. These images obviously share a number of elements in common, namely Mary and Jesus, but they have something else in common that is not immediately obvious until it is pointed out: that is what, or rather who, is missing from these scenes: there is no Joseph. Some wag pointed out that of course there is no Joseph he must have been painting the icons, like a proud father taking photos of his family. But when you really stop to think about it we don’t see or think about the figure of Joseph very much at all. Now I am not suggesting that he has been entirely forgotten by any means – we have a figure of Joseph in our nativity scene and as you go up the stairs to the upper room there is a stained glass window that has a nativity scene including Joseph but I hope you are with me on the basic premise, that compared to Mary, Joseph tends to feature much less highly in our thinking. Now in a church dedicated to St Mary on this fourth Sunday of advent it might be expected that we should focus our attention on Mary’s submission to the will of God that made the incarnation possible. However, if we let it, the gospel reading for today actually forces our attention, for a change, towards Joseph; a member of the holy family, a saint in his own right and whose ‘yes’ to the will of God was just as important in many ways as Mary’s both in terms of making the incarnation possible and in terms of what we can learn from it in our own lives. But before we look at today’s reading more closely I want us to try and imagine the man that we are talking about. There are some basic facts that we know about Joseph from the bible and there are other things that church tradition adds – we are not obliged to take church tradition as gospel, if you’ll pardon my use of the phrase, but it can be very helpful. So what does the bible actually tell us about Joseph? Firstly we know that he could trace his roots back to King David and beyond – the gospels of Matthew and Luke both contain genealogies of Jesus and the one in Matthew is traced back to King David through Joseph. So Joseph is of long standing Jewish heritage – but just because he can trace his family tree back to royalty does not mean he is wealthy or aristocratic, far from it. It is often assumed that Joseph was a carpenter by trade and that he passed on his trade to Jesus but the word used to describe Joseph’s occupation in the Greek was actually Tekton which means artisan or builder. An artisan or builder could certainly work in wood but, interestingly, could also describe a stonemason – I say interesting because when you think about some of Jesus’ parables that include mention of cornerstones or capstones or building houses on a rock, or indeed naming Peter as the rock on which the church would be built, it is far from inconceivable. Either way Joseph was a skilled manual worker from solid Jewish stock. To these basic facts church tradition tells us that Joseph was quite a bit older than Mary and when he is depicted in church art he is often shown that way – if you look at the stained glass window on the way upstairs Joseph is shown as a mature man whereas Mary is always thought to have been not much more than a teenager. One reason Joseph is thought to have been much older than Mary is because he is not mentioned in the gospels after the time Jesus is twelve and Joseph and Mary find him in the temple teaching the scribes. Joseph does not feature again and it is thought that he died before Jesus started his ministry. Eastern Orthodox tradition goes a little further and says that Jesus’ brother James, who became leader of the church in Jerusalem and wrote the book of James, was actually Joseph’s son by a previous marriage. 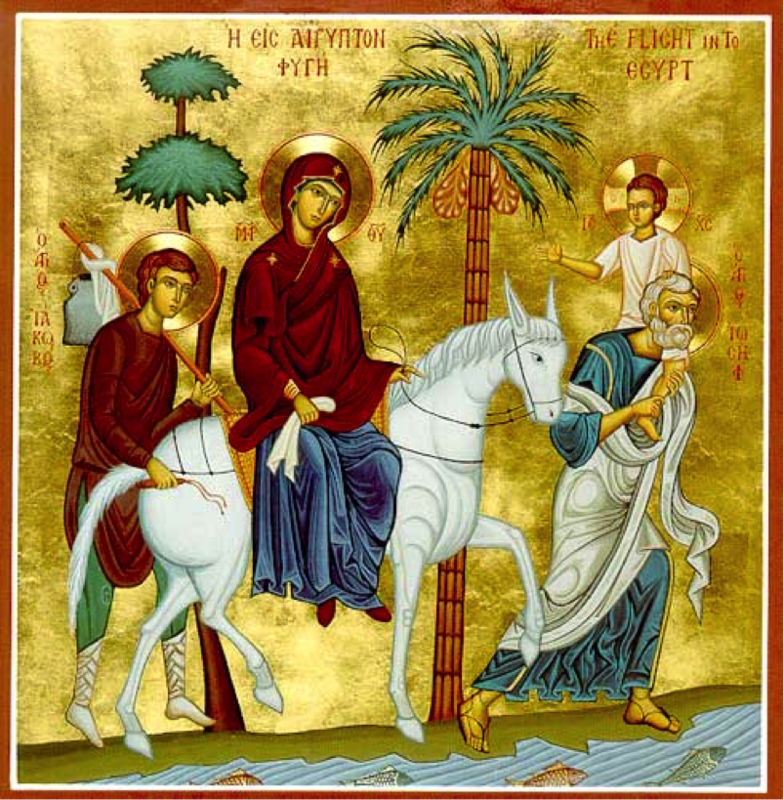 There is an orthodox icon, which unfortunately I can’t show you right now but which you can see if you look at this sermon on my blog, shows the holy family fleeing to Egypt which has Mary riding a colt, being led by a grey bearded Joseph who carries an infant Jesus on his shoulder and they are followed by Joseph’s son James. As I say I am not suggesting that you have to accept those ideas as any more than traditions that help explain some of the gaps in the narrative we have, but I think that they do give good food for thought. Although we have little in the way of factual information about Joseph today’s gospel reading actually tells us a great deal about his character and in many ways that is a lot more useful for us when thinking about the way we interact with God and with others. In Jewish culture at the time marriage was a two stage process that started with betrothal, perhaps as we might have engagement now. However unlike a modern engagement when a Jewish couple became betrothed at the time they would probably take a vow of celibacy that would be respected until the marriage proper was completed. I think we can imagine that that must have been a difficult conversation. It is clear that, at first, Joseph did not believe Mary’s story about the baby coming from God and he decided that this relationship was not going anywhere. And you have to admit that it is not a great start to married life when your betrothed drops that one on you – despite the gap in culture and time I think we can all understand that. Now, had he wanted, Joseph could have made life very hard for Mary – in his eyes she had committed adultery and under the Mosaic law the penalty for adultery was death. Joseph could certainly have turned Mary over to the court and she could have been stoned to death. But we are told that Joseph was a ‘righteous’ man and did not want to expose her to public disgrace and he decided that the best thing to do would be to quietly break off the marriage contract. In this context it is interesting to remember the story about Jesus and the woman caught in adultery – whom Jesus saved from being stoned to death. I wonder whether the fact that Jesus’ own mother could have faced this same fate but for the kindness of Joseph played a part in this story. Supposition no doubt but it is interesting to try and connect the dots. Anyway, Joseph decided to quietly break off his engagement to this girl who seemed to be no better than she ought to be. And then God intervened – but he does not intervene by sending a mighty Angel to deliver a message in person – or rather, he does send an angel but the angel appears to Joseph in a dream. In Joseph’s dream the angel of God reveals that Mary’s child is indeed from God, that Joseph should not be afraid to take her as his wife and that the child has been sent to deliver the world from its sins, in fulfilment of the messianic prophecies. The important thing here is that when Joseph woke up he had a very clear choice. He could have done what most of us do every day which is to have dismissed his dream as no more than a dream brought on by Mary’s story and the stress of the situation. But no, Joseph took the much harder option of trusting that God had really spoken to him, of accepting that God wanted to work his will for the world through these unusual and difficult circumstances and that he would say ‘yes’ to playing his part in God’s story in the world regardless of the personal consequences. And we should not underestimate those consequences – whether people thought that Joseph had broken the vow of celibacy or that Mary had been unfaithful to him the potential shame on him was substantial. But Joseph was a ‘righteous’ man and it is clear that being righteous is very different from being self-righteous. Joseph would have known the prophecies in Isaiah from an early age, he heard Mary’s story and God brought those two things together in his dream and Joseph decided to trust God and to trust Mary. And Mary gave birth to a son but it was Joseph who gave him the name Jesus. From today’s reading I draw two main lessons: Firstly let’s not forget the important role that Joseph plays in the nativity story and in the childhood of Jesus. Joseph’s ‘yes’ to God’s plan was as important in many ways as Mary’s – they were a couple, a family, and they acted as such in bringing Jesus into the world and in bringing him up. Secondly, we should be open to letting God communicate with us in ways we may not expect. Some may hear God through having an angel standing in front of them, but for others it will be in a dream, in the pages of the bible, in prayer, kneeling at the communion rail or in the circumstances of life. God treats us all differently but I do believe that He does want to communicate his love and his plan to each of us – but it is up to us whether we listen and whether we have the trust like Joseph and Mary to say ‘yes’ to God.